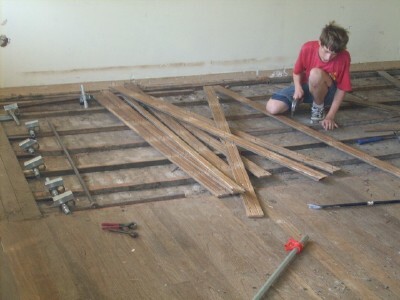 PC and Team have spent days over the last three weeks salvaging timber flooring for our extensions. 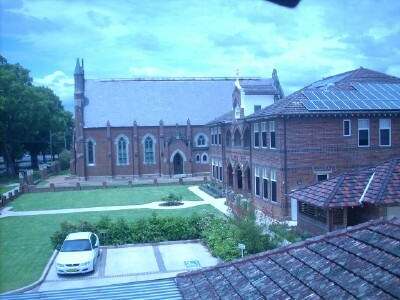 Our local Convent (to the right, Church is in the background) is dismantling their old School (picture taken from the School looking out over the rooftops.) 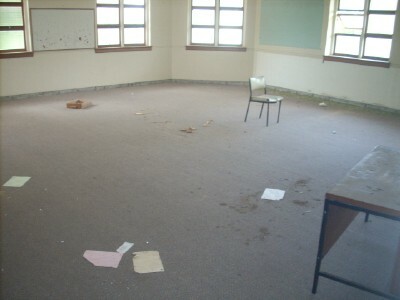 Remember my find of blackboards and corkboards? 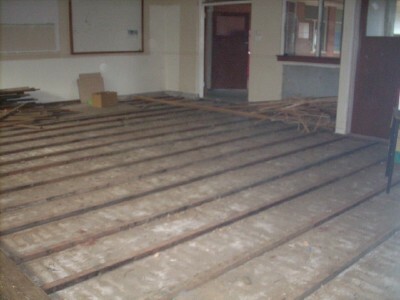 During that visit it occurred to PC that under the carpets lay timber, sitting on concrete floors. We inquired, researched and made a bid which was accepted. 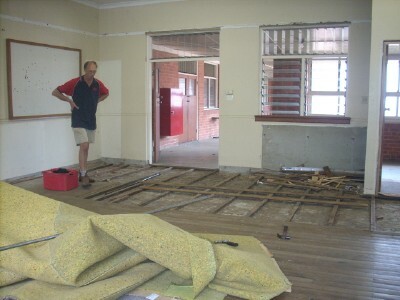 The job that now lay ahead was to ‘rip up’ five large rooms of yellow box, which we will then lay in our new extensions. 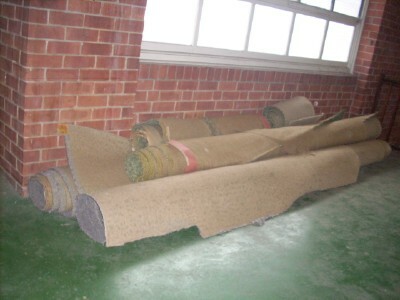 First they had to roll up the carpets and move them out of the rooms. Then all the staples had to be pulled out, which fell to Koala and Michelangelo. One time consuming part was starting from the edge of each room. 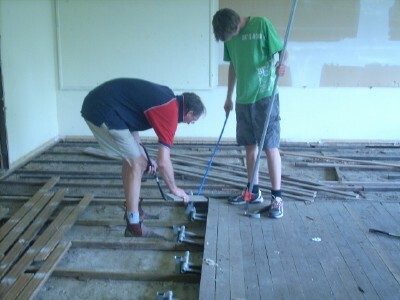 PC as inventive as ever, was sure there was an easier way to lift floorboards than just using crowbars. He made an invention that not only saved time but increased salvage rate. These were so successful he welded several more through the weeks. 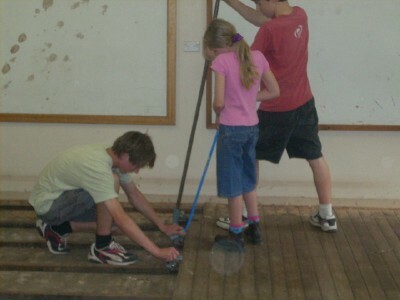 Part of the team worked on lifting the boards. 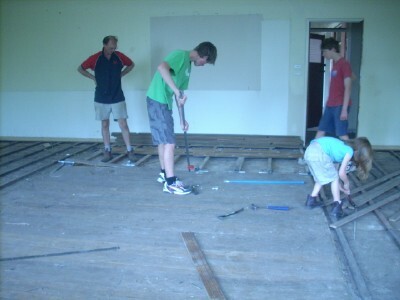 Others teams worked on removing the nails. Jelly Bean was keen to help and spent a morning being part of the team. First room is completed! A good day’s work. Second room being smaller didn’t take long. Working in tandem lifting the boards and de-nailing as they go. Princess impressed us with her willingness to work for days on end. Once again we were so proud of the children, they were valuable members of the Team. Timber stack begun, piling higher now. 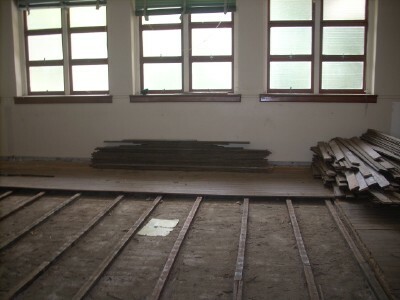 One more room to go and then another challenge…removing the boards from the second floor. Can I just say that your family is amazing?!!! Did you hear my jaw drop? Just for the record, I am impressed and envious. Showing this post to my hubby and sons 😀 — thanks for sharing! Why ladies, thank you for such lovely words:) I just keep smiling when I read your comments. Construction Worker … and the list goes on and on and on… Wow! These children could give team talks in schools. The Dept. of Ed. could employ them to go around the country giving motivation talks, lol. Reminds me of the 'glory days' here when we were doing such projects. Very true Gae, lifetime memories. I can see the unity in your family. Its amazing team work which you have done. I love your post, especially the images you had attached on your blogs. Thank you for sharing such wonderful post like this. It's very informative and does make sense for all. 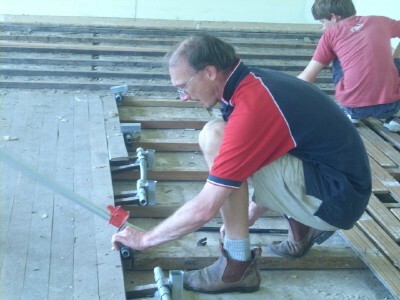 Looking forward for more of your post with regards to timber floors. Thank you and more power.